Little Foot Blue Squeegee - This squeegee measures about 6 inches along the usable edge. The pointed edge allows the installer to get into very tight areas. The Blue Little Foot is the softest of the line in flexibility of all the Little Foots. The 6" pointed blade is perfect to get into those hard to reach spots. 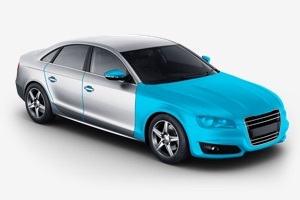 If this one is a little too soft there are two other options to fill your tinting needs.